Cusick Studio Collection, Graphic2_FreezerBag32_8473. Click to enlarge. On Wednesday, February 4th, our library staff will be heading up the hill (literally) to the State Capitol for another Piecing Together History event: Representing Kentucky. Around our neck of the woods, we refer to this as the “New” Capitol Building (1910) since the previous, or “Old” State Capitol is a only a block away, and a part of the KHS campus. Our trip Wednesday coincides with the Legislative Regular Session for 2015, as we celebrate Kentucky’s “New” Capitol Building, and the Legislatures who represented Kentucky during the first 30 years of the 20th century. This month’s History Mystery comes from the Piecing Together History event on Wednesday. The photo is roughly from 1930 and includes a group of eight men, one holding the Kentucky Progress Magazine standing beside the State Capitol. 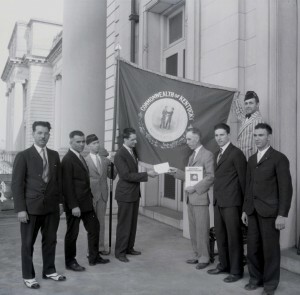 The General Assembly passed an act, approved March 16, 1928, that created the Kentucky Progress Commission to “promote the development of the Commonwealth of Kentucky, making a general study of its resources, facilities, and advantages for agricultural, commercial, and industrial development and for the attraction of tourists to the Commonwealth.” The act appropriated $50,000 for the biennium. One of the ways the commission promoted Kentucky was through its publication, Kentucky Progress Magazine. All of the images used in this event have been digitized and cataloged and are available for researchers during and after the event. To view any part of the collection, visit kyhistory.com and click on the Featured Collection. For those who cannot attend, please submit image specific information via the comments section at the bottom of each image. Specific questions about the photographs or the event can be directed to the KHS Reference Desk at 502-564-1792, ext. 4460 or KHSrefdesk@ky.gov. free sample simply need to bear in mind that the that nil wish revise. The gentleman holding the magazine appears to be C. Frank Dunn, Executive Secretary of the Kentucky Progress Commission, whose photo appears on page 16 of “Kentucky Progress,” Volume 1, Number 1, September, 1928.